Lizan Nijkrake published on 25 March 2019 an excellent piece under the title “Should it be a crime to help illegal immigrants?” She describes how European defenders of migrants are being prosecuted for aiding illegal immigrants. EU states had a choice to exempt humanitarian aid from criminal charges but most didn’t take it. And those who did are not always following the rules. In 2002, the EU adopted a directive that requires all EU member states to impose sanctions on citizens who intentionally help illegal immigrants secure unauthorized entry into, transit across or residence within in the EU — thus making it illegal to offer aid in the form of free rides or overnight stays. The directive says its objective is to “combat the aiding of illegal immigration” to further the EU’s goal of creating “an area of freedom, security and justice.” But in a study for the European Parliament, the Centre for European Policy Studies (CEPS), a Brussels-based think tank, concluded that the EU rules are not in line with the United Nations Protocol against the Smuggling of Migrants by Land, Sea and Air. The UN protocol stipulates that assisting a migrant can be a crime only when there is a clear aim of making money or other material gains. While the EU directive says offering overnight stays is illegal only if it is done for profit, CEPS reported last December that 13 out of 28 member states have criminalized free sleepovers. Out of 28 EU countries, CEPS says that only four have laws that adhere fully to UN protocol: Germany, Ireland, Luxembourg and Portugal. The EU directive allows member states to exempt individuals from sanctions for helping illegal immigrants enter or move across EU territory if done for reasons of “humanitarian assistance,” such as giving food, shelter and first aid to people in need. Nine member states have included some types of exemption in their national laws, according to the European Commission. But the CEPS said states should be required to make such an exception. “And even in the European nations that have exempted humanitarian acts, we still see prosecutions happening, for example in Italy,” said CEPS researcher Lina Vosyliūtė. Lizan Nijkrake’s piece gives concrete examples of how the laws and the application in practice are affecting those who try to help. But no change is expected any time soon. The European Commission has consistently said there’s no need to change the law. In early 2018, Nijkrake wrote that it should be left to judges in the countries themselves to decide on a case-by-case basis whether or not to prosecute citizens. It has noted that few people have been convicted. While most of those charged have been acquitted, in the case involving Van Gestel and Berghe (in Belgium), seven of the defendants were convicted and given suspended sentences of 12 to 24 months. More than 170 organizations have launched an initiative, “We are a welcoming Europe – let us help!” (#WelcomingEurope), with the goal of securing a million signatures on a citizens’ petition that calls for migration policy reforms, including the decriminalization of deeds of solidarity. The Council of Europe’s Democratic Governance Department has been working for some time to put into practice the recent Committee of Ministers Guidelines for civil participation in political decision-making . Now it is again turning to supporters of participatory democracy and to anyone with fresh ideas to help find a unifying visual symbol, an original design for a logo or emblem. The logo should highlight, in a symbolic way, the importance of public/civil participation in decision-making at all levels of government. It should be very simple and expressive, while appealing to both sides in the democratic decision-making process – the public authorities and civil society. The logo is meant to appear on all that will be done by the partners – news items, video clips, reports, meeting programmes, etc. Ideally, people will gradually start associating it with our joint work on civil participation. We are looking for a small graphic symbol, preferably without text. The logo of the No Hate campaign of the Council of Europe could serve – very approximately – for orientation. …“civil society at large”: the ensemble of individuals and organised, less organised and informal groups through which they contribute to society or express their views and opinions, including when raising issues regarding human rights violations, corruption and other misconduct or expressing critical comments. Such organised or less organised groups may include professional and grass-roots organisations, universities and research centres, religious and non-denominational organisations and human rights defenders;..
On 9 May 2018, Hungary’s (remaining) civil society issued the Professors Solidarity Call below, signed by 77 professor until now and asking for more signatories. It concerns the so-called “Stop Soros” bill, to be voted by the Hungarian parliament very soon, which will have a devastating impact on both Hungarian civil society and the asylum seekers and refugees that are already in a dire state. That Victor Orban is behind an ‘anti-Soros bill’ is the more remarkable as he himself was the beneficiary of a Soros scholarship [in 1988 a dissident Hungarian university graduate wrote a letter to George Soros, a billionaire philanthropist, asking for help obtaining a scholarship to Oxford University. In the letter, which has recently resurfaced, the young Viktor Orban said he wanted to study the “rebirth of civil society”. He got the scholarship.– the Economist 7 April 2018]. We, 77 university professors and academics from 28 countries around the world, express our solidarity with the Hungarian Helsinki Committee and the independent Hungarian civil society, which currently faces an imminent existential threat. The so-called “Stop Soros” bill, to be voted by the Hungarian Parliament in mid-May 2018, will have a devastating impact on both Hungarian civil society and those vulnerable human beings that cannot count on anyone else’s support. The new legislation will allow the government to simply ban the activities of organizations assisting refugees and migrants in a fast and arbitrary process. Activities such as legal aid to asylum-seekers, reporting to the UN or the EU, holding university lectures about refugee law or recruiting volunteers will be rendered illegal, if these are performed by civil society actors who dare to criticise government practices. Practices, which are equally condemned by the EU and the international community. The Hungarian Helsinki Committee (HHC) is an outstanding human rights organization, well-known and respected for its professionalism around the world, not only by civil society, but by academia, state authorities and the judiciary as well. The HHC has massively contributed to the promotion of refugee law education and legal clinics on various continents. We all personally know and highly respect their work. States should be proud of such NGOs, instead of aiming to silence them. Strong and independent civil society organisations are as indispensable for democracy and the rule of law as strong and independent universities. If NGOs such as the Hungarian Helsinki Committee are threatened, democracy is threatened. If a prestigious organization, winner of various international human rights awards, can simply be banned from providing legal aid to refugees, if a globally reputed voice of human rights can be silenced with an administrative measure in an EU member state, then further dramatic anti-democracy measures are likely to follow. There is a real risk that the Hungarian example will be increasingly copied elsewhere, and soon it may be too late to stop the domino effect. We call on our governments to express, without delay, their vivid discontent with Hungary’s legislation aiming at annihilating independent civil society. We call on universities around the world to do the same and actively demonstrate their solidarity with the Hungarian Helsinki Committee and the entire threatened Hungarian civil sector. We call on the European Union to prove to the world its credibility as a guardian and global promoter of fundamental rights, and immediately take action to prevent this flagrant human rights violation from happening on its own territory. Viatcheslav Moshe Kantor launched in early March 2018 a new award – the European Medal of Tolerance – aimed at fighting extremism and promoting peace in Europe. The European Jewish leader announced the prize at the European Council on Tolerance and Reconciliation (ECTR) round-table event at the Salon Bellevue in Monaco.The €1 million prize also referred to as the “Kantor Prize for Secure Tolerance” is awarded by ECTR’s panel of academic advisers to those who achieve exceptional research that advance the idea of “secure tolerance.” Candidates for the award need to present original and creative research on the ways the practice of tolerance can address the challenges of a globalized world and societies that exhibit rich diversity. The award is intended to foster progressive thinking that will be helpful for Europeans as they deal with security and human rights threats. Human Rights NGOs in Europe no longer the standard to follow! In January 2018 the EU Fundamental Rights Agcncy (FRA) published a Report “Challenges facing civil society organisations working on human rights in the EU“. Its conclusion is that the situation is getting more difficult. Also, on 26 January 2018, the Thomson Reuters Foundation published an interview with Michel Forst, the U.N. Special Rapporteur on human rights defenders said that the EU are setting a bad example by allowing some of its members to stifle human rights groups, which is encouraging crackdowns elsewhere in the world. In the interview done by Umberto Bacchi, Michel Forst said that the EU has historically done a good job supporting and protecting rights advocates worldwide but the bloc’s authority is now being undermined from within. Officials in Burundi, Democratic Republic of Congo, Israel and other countries pointed at recent laws in Hungary and Poland to justify their own regulations which may curb the independence of non-governmental organisations. “There is a need for European countries to be more coherent … not to teach human rights outside of Europe and then not respecting human rights inside Europe,” said Forst, the U.N. Special Rapporteur on human rights defenders. Charities in dozens of countries, from Angola to India and Tajikistan have faced restrictions targeting their funding and operations over the past two years, according to an EU report. The trend is part of a global backlash on civil society that has seen rights activists in some parts of the world criminalised or branded as troublemakers, Forst stated. Last year, Hungary introduced a measure requiring NGOs that get money from abroad to register with the state, a bill that NGOs say stigmatizes them and is intended to stifle independent voices. [see also: https://humanrightsdefenders.blog/2014/06/13/human-rights-defenders-in-hungary-not-yet-foreign-agents-but-getting-close/]. Poland instead introduced legislation to set up a centralised authority controlling charities’ funding. [see also: https://humanrightsdefenders.blog/2017/03/02/backsliding-on-civic-space-in-democracies-important-side-event-on-3-march-in-geneva/%5D. As countermeasure, the EU should boost direct funding of rights groups operating within its borders, Forst said. “What is absurd for me is that the EU is funding organisations in Latin America, in Africa – which is good – but there is no more funding for EU NGOs,” he said. Money should be allocated from a dedicated fund and not channelled through governments, he said. Besides Europe, Forst also singled out Australia for its treatment of asylum seekers held in offshore camps, adding it was “not a safe place” for human rights defenders due to pressure from the government. A December report by Pro Bono Australia and the Human Rights Law Centre, two rights groups, found Australian NGOs were often pressured into “self-silencing” their advocacy work fearing funding cuts and political retribution. “(Global civil society) space is shrinking because it is shrinking in Europe, because it is shrinking in the Americas, in Australia,” said Forst. The FRA’s report finds that civil society organisations in the European Union play a crucial role in promoting fundamental rights, but it has become harder for them to do so – due to both legal and practical restrictions. 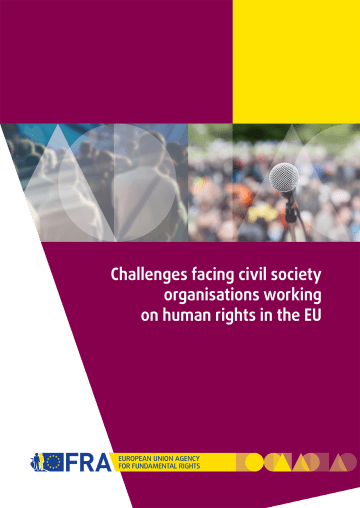 This report looks at the different types and patterns of challenges faced by civil society organisations working on human rights in the EU. While challenges exist in all EU Member States, their exact nature and extent vary. Data and research on this issue – including comparative research – are generally lacking. The report also highlights promising practices that can counteract these worrying patterns. The European Union – when criticizing countries by name in the UN Human Rights Council – does so with unanimity. It was the first time that the European Union did not make a statement in the Human Rights Council regarding rights violations in specific countries, including China as it was blocked by one of its member countries: Greece! A spokesman for the Greek Foreign Ministry in Athens called it “unproductive criticism.” The NYT reports that a spokesman for the Greek Foreign Ministry (who requested anonymity) said in a telephone interview: “When the stability of a country is at stake, we need to be more constructive in the way we express our criticism” …“because if the country collapses, there will be no human rights to protect.” It was an odd explanation, commented the NYT, considering that China’s stability does not appear to be at risk. Unless the stability at stake was referring to Greece?! In its struggle for economic recovery, Greece is indeed increasingly courting Chinese trade and investment. China’s largest shipping company, known as China COSCO Shipping, bought a majority stake last year in the Greek port of Piraeus. The Greek prime minister, Alexis Tsipras, has visited China twice in two years. And China will be the “country of honor” at Greece’s annual international business fair in September in the port of Thessaloniki. On 4 April 2017 Nils Muižnieks, the Council of Europe’s Human Rights Commissioner, wrote about “The Shrinking Space for Human Rights Organisations“. The new EU ‘alert site I referred to yesterday [see: https://humanrightsdefenders.blog/2017/04/03/protectdefenders-eu-launches-new-alert-website-but-no-single-stop-yet/] showed in 2016 some 86 reported violations in the European (and Central Asian) region, mostly detention and judicial harassment. Also the recent CIVICUS findings of the narrowing space for civil society points in this direction. An example could be Hungary as illustrated by reports of Human Rights Watch (2016), Human Rights First (2017) and Amnesty International (2016/17); the issue of academic freedom is not directly related but part of the restrictive trend [see links below].